The resurgence of Archie Comics has been one of the most fascinating, unexpected developments in recent comics-industry history. As of just a few years ago, the company was an afterthought in the publishing world, cranking out cartoony, barely noticed tales about Archie, Betty, Veronica, Jughead, and the rest. But after a change in management in 2009, Archie Comics began crafting inventive new gimmicks for these 60-year-old archetypes. There was Afterlife With Archie, in which Archie becomes a zombie hunter; there was Archie vs. Predator, in which the Riverdale gang goes up against the alien menace from the Predator movies; and now the company is embarking on its riskiest gambit yet: a gimmick-free, straight-faced reboot of the Archie universe. Starting with this week’s Archie No. 1, readers will get to see a brand-new take on Riverdale, in which all the classic characters are modern-day teenagers. Realistic comedy is the order of the day: All the characters look like normal humans, rather than the wacky caricatures they’d been in previous decades of Archie storytelling; their adventures are told with naturalistic dialogue, not stilted zingers. Making these characters relevant again (and doing so without coming across as pandering) is a challenge, but Archie Comics has enlisted two industry heavyweights to guide the effort. Writer Mark Waid is one of the most venerable names in comics, having written acclaimed and best-selling stories for Marvel, DC, his own Thrillbent, and an array of other publishers. Artist Fiona Staples is the co-creator of Saga, Image Comics’ megahit about interstellar war and romance. They’re both operating outside their comfort zones with the Archie relaunch, but if the first issue is any indication, they’ve got a clear vision for making Riverdale relevant. 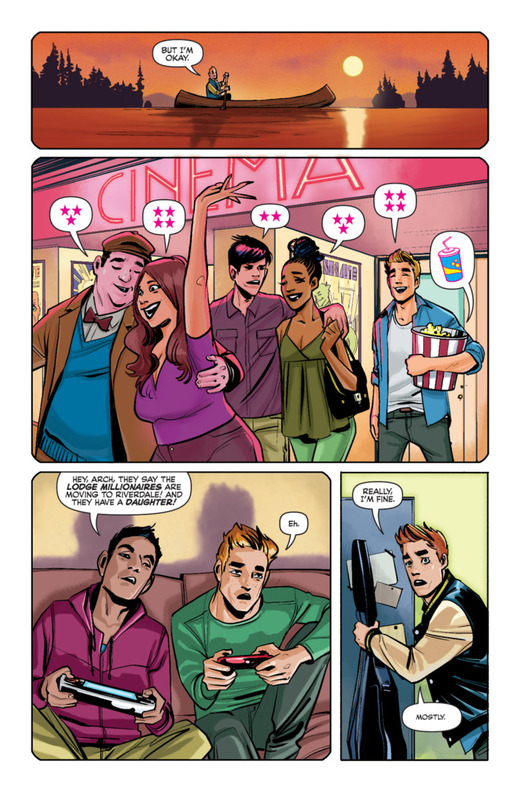 We have exclusive pages from Archie No. 1 below, as well as a conversation with Waid and Staples about why Archie has survived this long, how to draw a school dance, and the possibility of an Archie-Godzilla crossover. 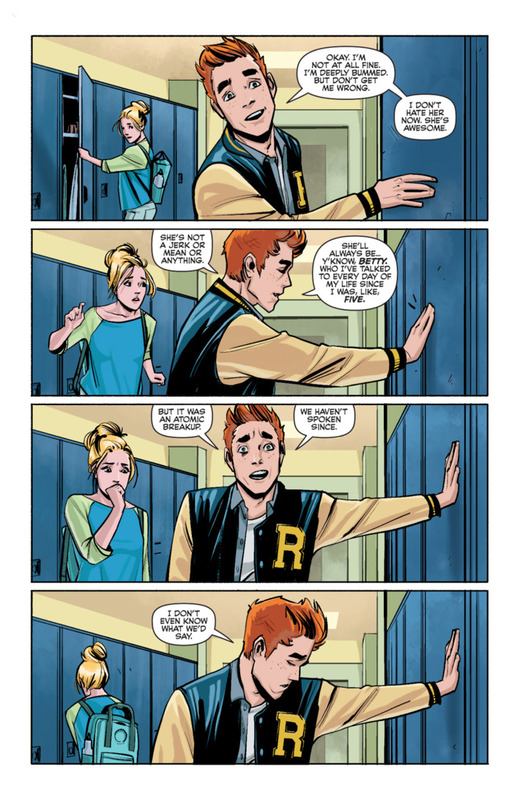 What would you say to sell someone on an Archie story in 2015? Mark Waid: That funny is timeless. What was the first Archie story you read? MW: Even with my superhuman memory for comics, I can’t honestly say exactly which Archie story was my first, though I have very strong memories of Principal Weatherbee screaming at Archie for something that wasn’t his fault — and if that’s why I to this day have a flinch-fear of authority ​baked into my DNA, Weatherbee and I are going to have to have words. Fiona Staples: I can’t say I remember the first story, but I read a lot of the old digests when I was little, and I loved all the Harry Lucey and Samm Schwartz strips long before I knew who the artists were! They were master cartoonists, and their command of gesture and expression has really impacted all the comic work I’ve ever done. How hard did Archie Comics have to sell you on taking the reins? FS: They told me they were relaunching Archie from No. 1, that Mark Waid was writing it, and then buttered me up with praise and flattery! So that was enough to make me desperately want to do the book. I just wasn’t sure I’d be able to balance it with my work on Saga. They needed the first issue of Archie done before our next Saga hiatus came around, so I’d have to work on both at once. I was very nervous about doing that, but thanks to our amazing Archie colorist Andre Szymanowicz, we got it in on time. Mark, you’ve rebooted a number of titles during your career. How does crafting a reboot of Archie differ? What are the fundamental tenets of the Archie-verse? The facts, traits, and relationships that you think are non-negotiable? MW: That Archie’s someone we root for and has a good heart even though he screws up. That Betty pines for Archie on some level and, likewise, Archie pines for Veronica. The idea that Archie is constantly “choosing” between the two girls is actually a fairly recent concept and something we’re shying away from — there’s a lot more dramatic and romantic tension in Betty being an underdog. FS: I tried to be true to the classic versions of the characters, but also give a nod to the more nuanced personalities and complex backstories that Mark has given them. So Archie’s hair is the same general shape, but a more modern cut, and I kept a subtle version of the hash marks in the sides. Their faces are less cartoony, but I still gave Jughead a pointy nose and his iconic beanie, and Betty relatively soft features and casually pulled-back hair. It was when I was looking at Francesco Francavilla’s art on Afterlife With Archie that I realized the gang could be drawn in a radically different style and still be easy to recognize. Is there anything difficult about producing an Archie story? FS: Just how long it takes to get everything right, but that’s definitely a self-imposed issue! Mark, you say that writing a story about 21st-century kids and their mediums of communication is a challenge, but what about the substance of their communications? As a 53-year-old, how do you try to get the language and habits of a 2015 teenager right? MW: I consult with my girlfriend’s 16-year-old daughter and her friends. All I have to do is bribe them with iTunes cards. In your post-story essay in the first issue, you talk about how convincing people to pay attention to Archie is like your dad convincing you to appreciate Elvis. What struck me about that metaphor was that Archie was already more than a decade old when Elvis blew up! How do you account for that kind of insane longevity? MW: ​That, as different as our kids seem from us or from our parents, there are certain things about being a teenager that are eternal: feeling shy, feeling awkward, feeling attractions, feeling pressure. Style and entertainment tastes change, but the core emotions of being a kid — which, not coincidentally, are the core foundations of any good story — are constant. There’s a reason Archie didn’t go the way of Betty Boop or Davy Crockett or Woody Woodpecker, forgotten relics of a bygone era, and it’s because when Archie stories are at their best, anyone of any age can see a little bit of themselves in them. Fiona, are there technical differences between how you draw Saga and Archie? Or, say, philosophical differences? FS: The most obvious difference is that I feel a strong sense of ownership over Saga and its characters. [Saga writer] Brian [K. Vaughan] and I made them, we own them, and it’s unlikely that anyone else will ever work on them. So I draw it knowing that I can do whatever I want and the only person who needs to approve is Brian. 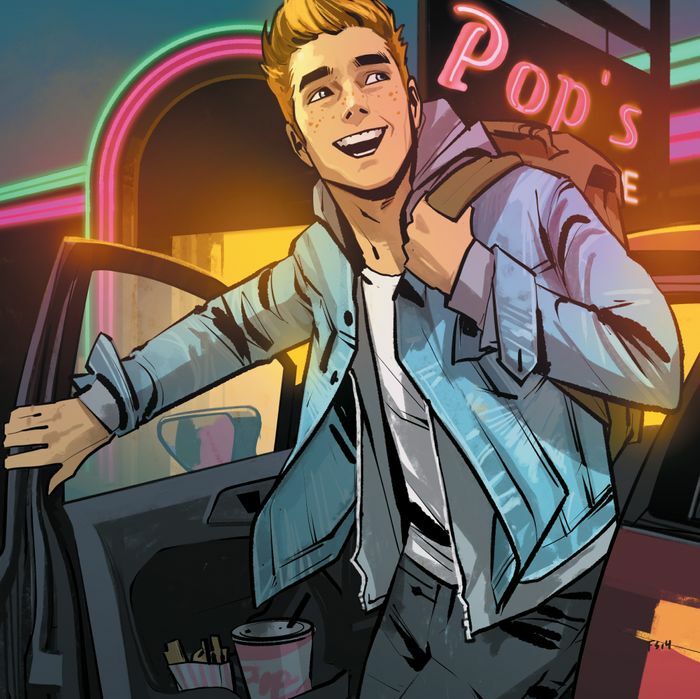 Archie is the polar opposite — the publisher has given us near-total freedom to do our version of the story, but it’s impossible to forget the property’s 75 years of history! Our take on the characters will always be just one version among many. It’s humbling and also a huge honor to borrow these characters for a little while. The main technical difference is that I draw Saga in full color, and I just do black-and-white lineart for Archie, which is colored with great style by Andre [Szymanowicz]. So I’m not in charge of everything from layouts to finalized art. It’s a collaboration: Andre has his own artistic sensibilities, and the final art ends up looking wildly different from something I’ve done everything on. 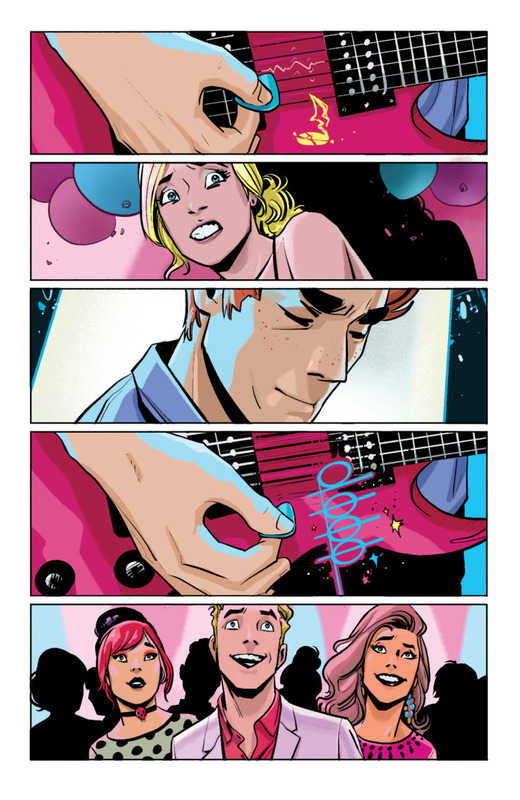 Fiona, the standout artistic moment from the first issue is a two-page spread of Archie playing guitar at a school dance. It incorporates musical notes in this fascinating way. How did that idea come together? FS: Thank you! There are a few parts in the issue where Mark doesn’t do a panel-by-panel script, but just says what action needs to happen and tells me to use as many panels as I need to show it. The script for this spread stated that Archie is playing guitar, some broken notes at first, then fewer as he gains confidence. The band joins in and he finishes with a big flourish as all the girls cheer. It’s pretty straightforward, but I wanted to express the music visually as well as I could, so I put the notes on a staff that weaves through the background of the panels and had Archie finish on a big vibrating chord. I had my musician brother pose for reference photos! What have you thought of Archie Comics’ recent experiments, like the dual-timeline Archie tales and the Archie-as-zombie-fighter adventures of Afterlife With Archie? MW: They’re great. In fact, Afterlife With Archie is one of my favorite comics right now, as is Archie vs. Predator, a sequel to the oft-forgotten judicial review case Marbury v. Archie. All of them, as wild as they can get, keep the heart of Archie Andrews exactly where it needs to be — an extra-special accomplishment when you’re fighting the Predator. What’s most liberating about doing an Archie story? FS: Even though I’m terrified of doing a disservice to these characters, there is a kind of reckless glee in doing something brand-new with them. I’m very grateful for the chance to tell a different kind of story with the gang! You say it’s nice to be liberated from continuity, but will you be establishing new continuity? Will the timeline reset after each little tale, as has been true for decades in Riverdale? MW: The story line and characters will be consistent in the main Archie book. Though episodic, there is a through-line about Betty and Archie’s romance now that Veronica’s in town, and there are running subplots peppered among the gags and slapstick. I don’t think we’ll have to “reset” again anytime soon, though I admit all bets are off if, say, Godzilla comes to Riverdale.